Sometime during the First Era, the Chimeri mage, Mavos Siloreth, had sealed Balreth, one of the Brothers of Strife, at the Charred Ridge and would die shortly after in an explosion. Siloreth was buried in Othrenis, in the largest crypt of the necropolis, which overlooked it from the south. Upon his death, Siloreth had summoned Skeletons to guard the necropolis so that no one would disturb him. During the Interregnum in 2E 582, the Daggerfall Covenant had invaded the region of Stonefalls, having laid siege over the harbor-city of Davon's Watch. 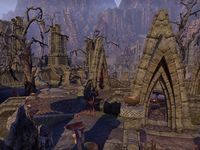 In order to break their siege, Tanval Indoril, the then Grandmaster of House Indoril, had re-awakened Balreth, who decimated the invading armada, however, Balreth had gone loose in the region of Daen Seeth, and so the Ebonheart Pact had sought a way to reseal Balreth into Ash Mountain. An Agent of the Pact had arrived onto Othrenis, seeking to re-awaken Mavos Siloreth and gain the knowledge to seal the Brother of Strife. After everything, the information necessary to seal Balreth was acquired and so the Pact was able to seal Balreth into Ash Mountain and continue their battle with the Covenant. During the Imperial Simulacrum in the late Third Era, the town of Eagle Moor was an active town, being ruled by Prince Zirimal. It had a rivalry with Silnim Dale and Oaktown. ^ The concept map of Morrowind consists of the settlements showcased in The Elder Scrolls: Arena with names that are reminiscent to Morrowind's names and locations. Eagle Moor was changed into Othrenis, considering where it is located in Arena versus where it is on the concept map. In the map, it is shown as a territory of House Hlaalu. This page was last modified on 27 February 2019, at 18:08.